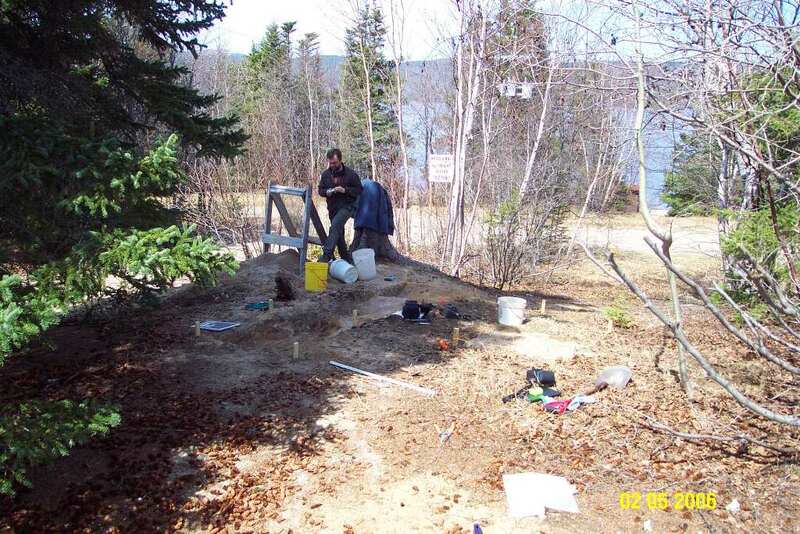 The South Brook Park site (DgBj-03) was originally found by David Reader in 1993 while he was surveying portions of the Bay of Islands and surrounding environs. At the time of its discovery Reader recorded the site as being badly disturbed by the construction of a water pump house and related piping and a road. The site had suffered considerable natural erosion as well. 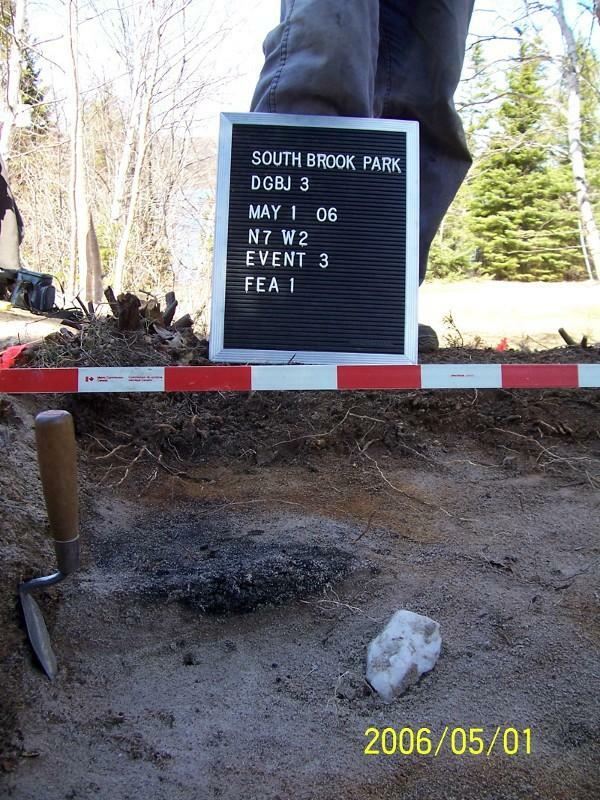 Despite this Reader returned to the site over the course of three years (1993, 1994 & 1998) and recovered a considerable amount of cultural material and charcoal for a radiocarbon date, all of which made the South Brook Park site the second oldest known Maritime Archaic occupation on the island. South Brook Park site, showing the water pump house to the right and the dirt road in the foreground. 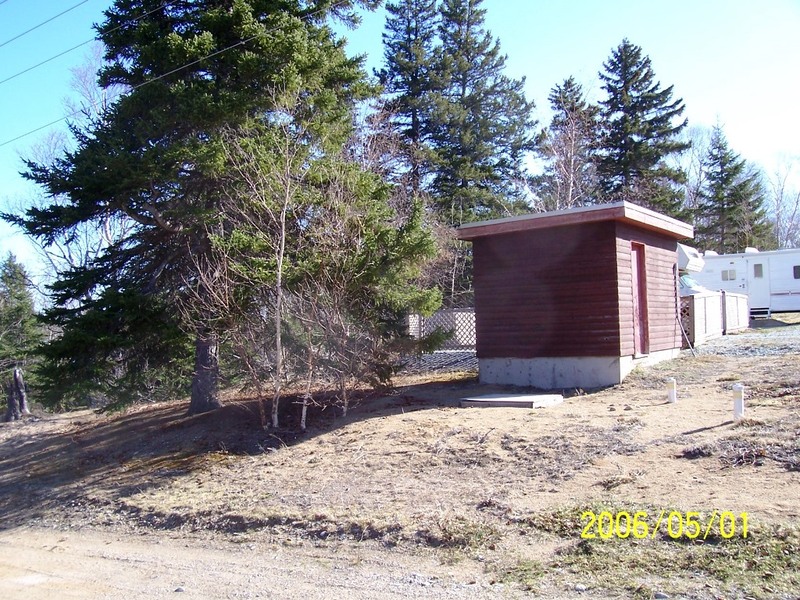 The main site area was behind the pump house and around the large evergreen tree. In 1993, the site was in the privately owned South Brook Park, on the southwest shore of Deer Lake, approximately 35 km inland of the Bay of Islands. The site was on a palaeo-beach ridge that ran southwest-northeast parallel to the present shoreline of Deer Lake. 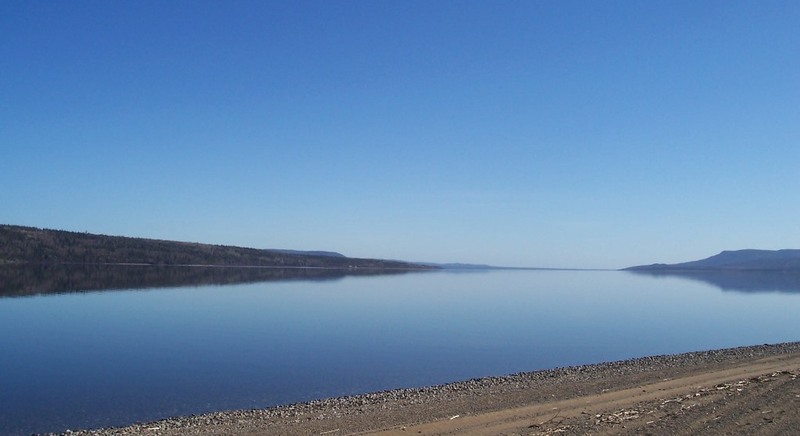 The elevation of the site component on the ridge is 10.3 metres above the average water level of Deer Lake, translating to approximately 14.3 metres above sea level (Reader 1999). 2006 PAO excavation showing the three beach ridges. The first beach is down by the water, the second is under the road in the background and the third contains the site. In the first season, the beach terraces in the park were test-pitted after cultural lithic material was found on the surface of a nearby roadway. Much of the lithic material found at the site was modified quartz and quartzite. This material is available in quartz and quartzite cobbles and may be found naturally on the beach at Deer Lake, just below the site. Further testing revealed additional cultural material and the approximate site size was delineated. A 1m x 4m trench was excavated at the western extent of the site where lithic material was surface collected. An in situ cultural deposit was located here, from which a fully channeled ground slate gouge was excavated (Reader 1994). 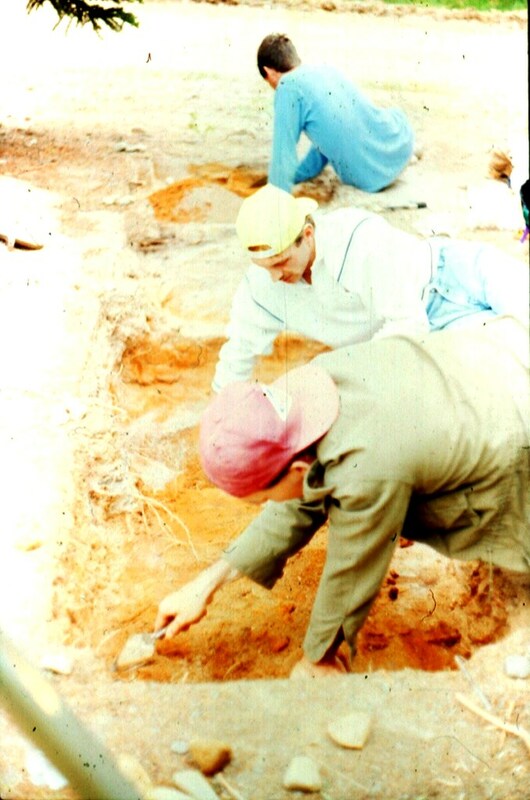 Reader and crew excavating the 1mx4m unit in 1993 (Reader). Fully channeled ground slate gouge from South Brook Park DgBj-03. Reader returned in 1994 and excavated a further 5.5 m2. During this season he recovered 15 quartz and quartzite core fragments, one quartzite biface, a quartz scraper and a large quantity of debitage from reduction activities. Five retouched chert flakes were also found. Perhaps the most significant lithic item recovered from this quartz and quartzite reduction area was a breccia hammer stone. According to Reader the hammer stone was found in direct association with the quartz and quartzite materials and indicates that Maritime Archaic inhabitants of this site were initially processing this locally available material by a means of direct and bi-polar percussion. In 1994 he also made note of the recovery of chert artifacts represented by a retouched flake and a retouched blade-like flake (Reader 1995). Assorted chert and quartzite pieces from South Brook. Top left, retouched blade-like chert flake; Top right, biface, quartzite; Centre, scraper, rose coloured quartzite; Bottom, hammer stone , breccia. Use-wear is visible at the pointed (left) end of the artifact (Reader 1995). In his 1999 report dealing with the 1998 excavations, Reader hypothesized that the site contained at least one early Maritime Archaic component (ca. 8800-6000 BP), based on the previous recovery of a full channeled ground slate gouge and a lithic assemblage dominated by quartz and quartzite. Such evidence is usually found on early Maritime Archaic sites. In 1998 he excavated a further 4m2 recovering, among other artifacts, two partial, triangular-shaped quartz projectile points and he identified the remnants of an ephemeral or disturbed hearth feature from which charcoal was recovered (Reader 1999). This returned an AMS date of 5140±50 BP (Beta-122766) making it the second oldest Maritime Archaic component on the Island of Newfoundland. Despite the site being terribly disturbed, Reader was able to recover a lot of information about the Maritime Archaic occupation of South Brook. One of his theories about the site was that it contained multiple Archaic occupations. He speculated that if we accept that the two partial, triangular-shaped quartz projectile points and all of the associated quartz and quartzite debris were similar to those recovered from Pinware Hill (the oldest known site in the province) then South Brook had an approximate earliest occupation period of ca. 8800-8000 BP. The full channeled ground slate gouge also suggests a relatively early-middle Archaic occupation here, in the range of ca. 7000-6500 BP, based on dated contexts in southern Labrador and the Maritimes which have produced full channeled gouges. Finally he speculated that all the chert and the radiocarbon date of 5140±50 BP were a third occupation (Reader 1999). Early Maritime Archaic projectile points from southern Labrador similar to the two found at South Brook Park (McGee and Tuck 1975). In 2005 the South Brook Park was sold to private developers with the intention of becoming a housing subdivision. Aardvark Archaeology was hired to conduct an historic resource impact assessment of the site. They excavated an additional 5.5m2 and several test pits elsewhere on the site. 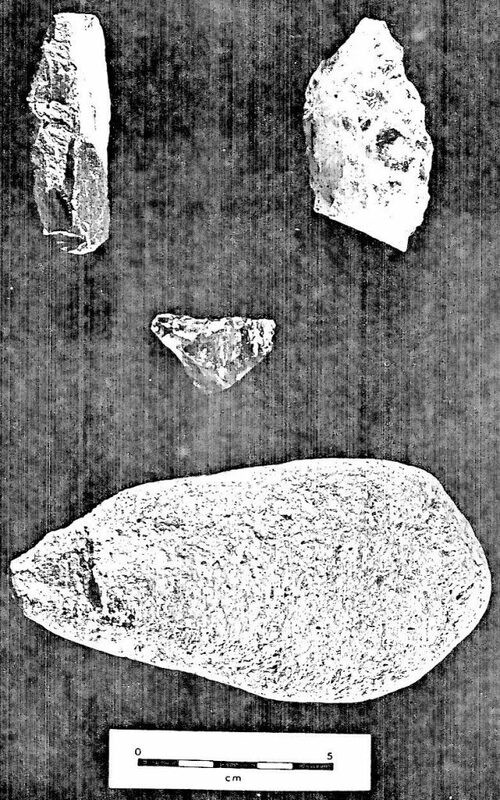 Aardvark Archaeology recovered 238 pieces of lithic material; all but one of them were flakes, including one retouched flake and a hammer stone. Sixty per cent of the flakes were quartz or quartzite while forty per cent were cherts. This ratio of quartz/quartzite to chert closely matches the findings from Reader’s investigations (Aardvark Archaeology 2005). Area excavated by Aardvark Archaeology (2005). Retouched flake and hammer stone recovered by Aardvark Archaeology (2005). In 2006, the Provincial Archaeology Office (PAO) completed the excavation of this site. A total of 4m2 and seven test pits were excavated. Initially the PAO was encouraged with regard to recovering charcoal. One of the first units opened had a large charcoal stain running through its centre which appeared to be in primary context with a large chunk of milk white quartzite just a few centimetres away. Upon completion of excavation of the four units and test pits no further artifacts beyond flakes and unfortunately the charcoal returned a very recent date of 140 +/- 40BP (Beta – 217827) (PAO Review 2007). Charcoal stain in association with a piece of quartzite as excavated by the PAO. Looking out over the Humber River towards Deer Lake. Taken from the beach just below the site. 2005 HRIA of the South Brook Park Site (DgBj-03). 2007 Volume 5 for 2006 Field Season. 1975 An Archaic Sequence from the Strait of Belle Isle, Labrador. 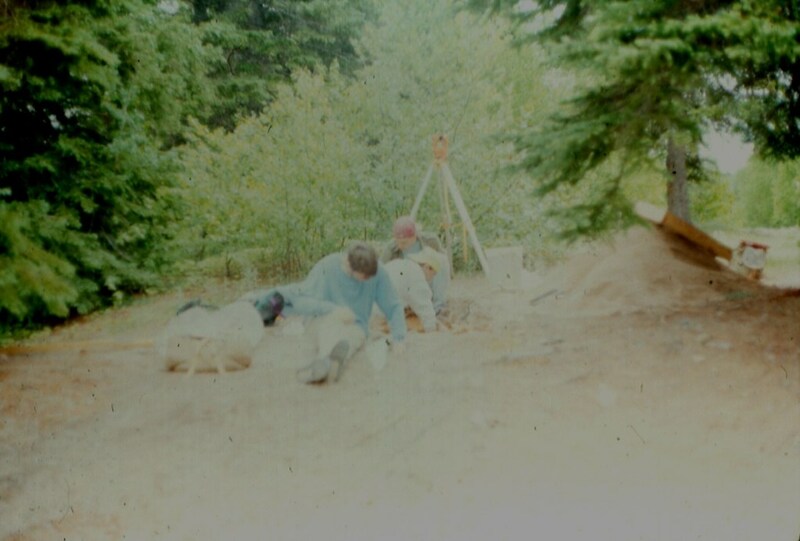 1994 The Deer Lake-Upper Humber River Archaeological Survey 1993. 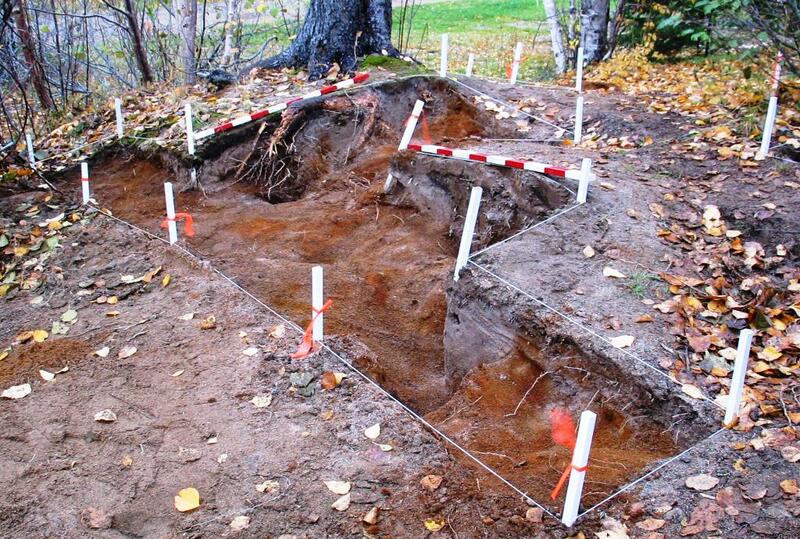 1995 Humber Valley Archaeological Project- Interim Report of 1994 Investigations. 1999 Revisiting the Maritime Archaic Component at South Brook Park (DjBl-09)- 1998 Archaeological Investigations. Love the article! Quartz anomalies are found on a beach at Hants Harbour. Interesting! Thanks Grant. As you know quartz & quartzite are widely available throughout Newfoundland and Labrador. At South Brook the Maritime Archaic made use of the quartz & quartzite. Yes, there is a substantial quartz vein that runs along the ridge, called the Slats, which is at the northernmost limits of Winterton. The vein continues towards Hants Harbour for several hundred meters and then disappears at lower elevations where it has obviously eroded Small, water rolled quartz stones are found on all the beaches but on one beach at Hants Harbour a piece of quartz about the size and shape of a beer box is found just above high water level. It appears to have been quarried from the ridge or dug from the ground and carried several miles, perhaps by water, to that location. It is all very intriguing!